Italian tenor, Pasquale Esposito, returns to the historic Carmel Mission Basilica for his 5th concert on Sunday, April 30, 2017 at 7:30PM. Pasquale will present an intimate, acoustic performance accompanied by concert pianist, Russell Norman. The evening’s program will include Opera Arias, Neapolitan Songs, Standards and Original Compositions. Pasquale, born and raised in Naples, Italy, immigrated to the United States to pursue his passion of music in 1998. He graduated from San Jose State University’s School of Music in 2009 and has released 7 full length CDs. In Spring 2015, Pasquale successfully premiered his 1st PBS Special: Pasquale Esposito Celebrates Enrico Caruso. The docu-concert pays homage to the legendary tenor Enrico Caruso, by taking the audience on a musical journey through the places and cities that shaped his career and legacy and made him an international star. The program has covered over 200,000,000 potential viewers and has raised over $500,000 for PBS stations nationally. The program will continue to be aired throughout the US thru 2018. Pasquale is presently touring with the Special nationally. The tour has included: San Francisco, Chicago, Detroit, Cleveland, Los Angeles, Palm Springs, Washington DC, Atlanta, Las Vegas, Denver, Pittsburgh, New York, Miami and many more. 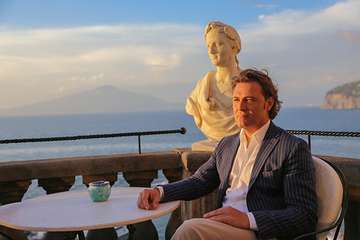 Aside from recording and touring, Pasquale made his successful debut at San Francisco Opera in June 2015 receiving rave reviews for his portrayal of Ragazzo del Popolo in the world premiere of Marco Tutino’s Two Women (La Ciociara). The New York Times stated that he sang with "airy charm" and The San Francisco Chronicle described Esposito as a "charismatic and dulcet-toned" singer that delivered a "splendid account." For more information, visit www.pasqualeesposito.com.